You are at the range and drop a ball on the ground (or place it on a tee). You grab a custom golf club randomly out of your golf bag and then try to hit the ball with club. It could be any club. Plus it simply doesn’t matter if the golf club is 32” or 48” since you only intent is to hit the back of the ball with the front of the face. The first in a sequence of things you do is set the clubhead behind the ball and then stand far enough away from the ball that your arms feel comfortable, and then you alter your hand height. This is all a subconscious response. The most amazing thing is you don’t ask what length is the club. Length itself is very important as it helps control the distance you hit the ball as well as develop consistency is the length is fitted correctly. The method most used involves placing the club in the playing position with the center of the sole touching the ground. This is how we measure our clubs at AGXGOLF.COM. A 48” golf club rule is placed along the backside of the club with the tip of the rule touching the ground by the club’s heel. The final length is measured at the edge of the grip cap (and not the very top). 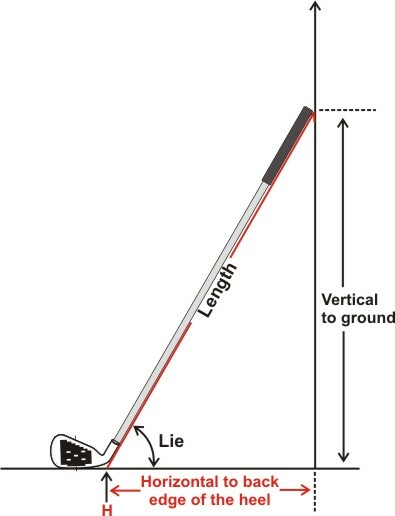 This method is used in all cases except putters that the shaft is not located at the heel. be off +/- 1/8” or even more. The United States Golf Association (USGA) has a method outlined in the Rules of Golf. The USGA uses an apparatus that has a piece of angle iron as a stop that forms at a 60 angle from the horizontal. Why 60°? Probably because this was the mid-way point of lies from years back when the driver was 56° and the wedges 64°, plus 60° is good even number. In addition, they measure to the very end of the grip cap and not the edge. This difference amounts to approximately 1/8” in the addition of the grip cap. The USGA does have a limit of 48” for any club, besides the putter, which has no length limits. No manufacturer measures custom golf clubs in this manner, perhaps out of tradition or that the length is being measured in the plane that the lie is referenced from the shaft / hosel, but may be a plausible method of measuring length someday in the future.